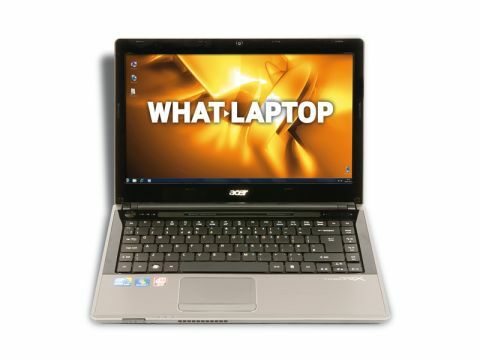 Acer's range of TimelineX laptops is built predominantly for consumers seeking performance and portability. To this end, the Aspire TimelineX 4820TG-5454G50Mn proves to be a great consumer option with its impressive power and stunning design. The laptop comes with a large 6-cell battery which sticks out awkwardly from the back of the laptop. With 661 minutes of battery life available, however, it's hard to complain. The sizeable battery does add a little weight and, at 2.3kg, the laptop isn't the lightest machine around – but we think it's a fair exchange considering the outstanding battery life on offer. Build quality is also excellent and the brushed-aluminium lid and chassis not only look smart, but provide excellent protection for all the internal components. The material is also very resilient to scratches and doesn't attract dust and dirt, making it ideal for life on road. The 14-inch screen features a 1366 x 768-pixel resolution and is bright, crisp and clear enough for reading and editing even the most detailed of documents. The lid folds back almost 180 degrees to the chassis, but the shiny Super-TFT screen coating creates reflections in bright light. The firm, flat keyboard is very comfortable to use and the spread-out keys reduce typing errors. As a result, you'll find this a very comfortable machine if you plan on spending a lot of time typing. Usually a massive battery life means the employment of a low-powered, resource-light processor. Here, however, the powerful Intel Core i5 450M chip proved extremely capable and produced a solid benchmarking result, just losing out to the Samsung R590. You'll have no problem running everything from word processors to media editing suites, and the power is such that it provides you with a great deal of futureproofing, so you won't have to upgrade for at least three years. Similarly, the ATi graphics card makes photo and HD video editing possible, and the latest games will also run, albeit with settings turned down. The 500GB hard drive provides comprehensive storage for all your files and folders, and there's also a DVD optical drive for watching films or burning backup discs, for example. 802.11n Wi-Fi and Gigabit Ethernet make this laptop a great choice for those looking to connect to the internet via wireless or wired networks.